Looking For Professional Services To Assist Your Business? ClosetMaid is the perfect partner for your business. Our innovative and budget friendly storage systems will add value to your range and help you to give your customers perfect organisation every time. We have a wealth of experience with builders, developers, architects & retailers, so we can offer you practical product and service solutions to suit your business. <¬ For more specific information related to your channel, use the links in the left hand column. Consultation: No one knows ClosetMaid systems better than our team of professionals. We can help make sure you have the right system for the right application every time, taking into account budget thresholds and design preferences. Design: Well designed storage is essential for meeting clients needs. Our design team will gladly take on the design task to help you maximise the storage potential for your clients. We have a range of pre-designed solutions for people who are on a strict timeline, or just to give you some ideas of what can be achieved. But if these don't suit, leave it with us and we'll come up with a bespoke package just for you! Good/ Better/ Best: ClosetMaid have a variety of products with optional upgrades and accessories to help your clients make the most of their space, and your sales team maximise spend potential. Logisitics: Our team will help you keep your project on schedule. With timely delivery direct to site, and efficient design services - from start to finish we can ensure your job stays on track and is delivered to your client as expected, when expected! We can recommend products for your showroom or show home to help your customers visualise their next project with ClosetMaid. Why should I use ClosetMaid instead of other more traditional solutions? > Available from stock ensuring on-time delivery. 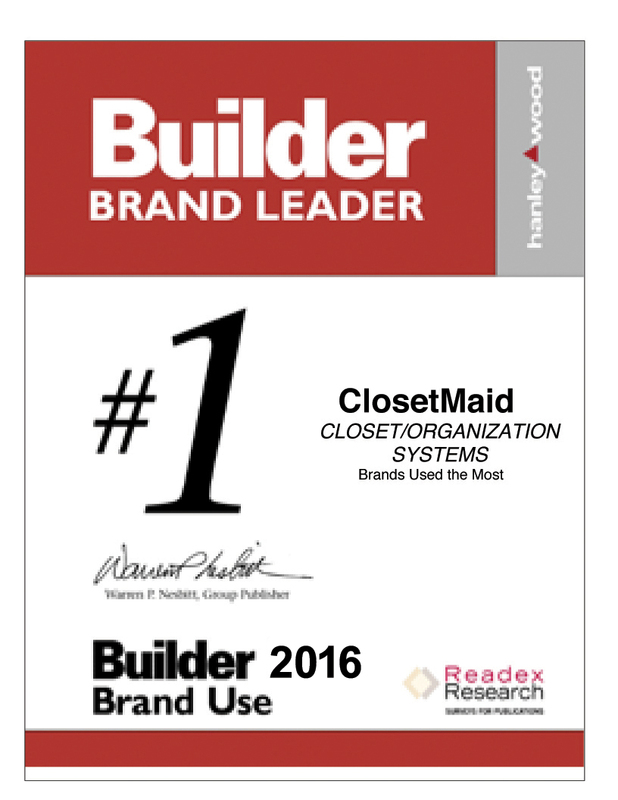 It's easy to see why ClosetMaid was voted Brand Used The Most by Builder magazine in the USA for eight years running.